“I enclose a rough memorandum of the state of our force at present, with a view to the calculation of subsidy. In this calculation I include officers, non-commissioned officers, men sick, absent, and present, and those absent on command, but not garrisons. I reckon the Hanoverian reserve, that is, those last arrived, which are called 10,000 men, as the contingent of Hanover; the remainder, or 15,867, as foreign troops in British pay will come into our numbers to make up our 150,000. I have not yet settled with the Duke of Brunswick, as the details of that settlement depend upon the settlement of Hanover, respecting which I am still in discussion; but taking his contingent at 3000 men; we shall have about 5000 to carry to our account, of which 500 will be cavalry. The Champ de Mai finally took place on the 1st June – a piece of splendid pageantry – in the shadow of the darker theatre of war. The 20 May 1815 marks the end of the Neapolitan War with the signing of the Treaty of Casalanza. This conflict, which had started on 15 March, was between the pro-Napoleon Kingdom of Naples on the one hand and the Austrian Empire on the other. Prompted by Napoleon’s escape from Elba, Marshal Joachim Murat, Napoleon’s brother-in-law, had declared war on Austria. He was concerned that the European Powers at the Congress of Vienna had plans to remove him and restore Ferdinand IV to the Neapolitan throne. Murat did not sign the treaty; he had already fled to Corsica following the decisive defeats at the Battles of Tolentino and San Germano. “The Neapolitans have hardly fought at all. Officers and men desert almost by regiments; the whole country has risen against Murat who deserves his fate by his perfidy, his folly, his gasconades and his lies. Ferdinand IV was restored to the Neapolitan throne on 23 May. With the 2015 General Election on 7 May, it seems timely to consider how elections and electioneering were practiced in earlier times. 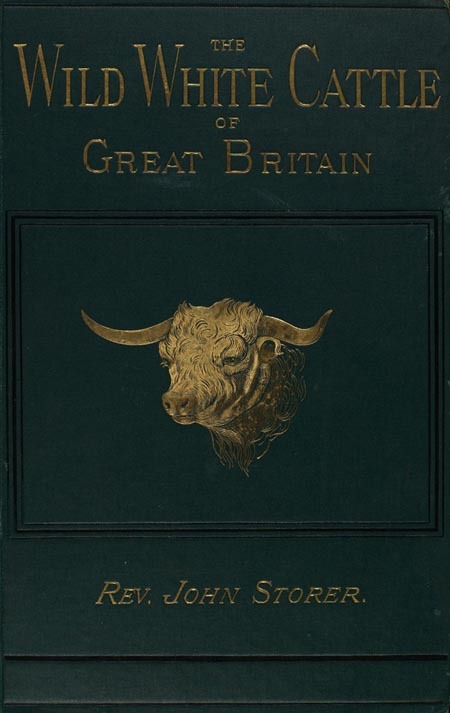 The Special Collections holds a range of material relating to politicians and politics. Below is a piece discussing the Southampton Poll Books which form part of the Cope Collection rare books. Major manuscript collections relating to politics from the eighteenth century onwards include the archives of the first Duke of Wellington; the Congleton Archive —with material for the Parnell family, which provides a fascinating insight into politics in Ireland; the papers of Lord Thorneycroft of Dunstan, who was a Conservative MP and Minister; and the Broadlands Archives. 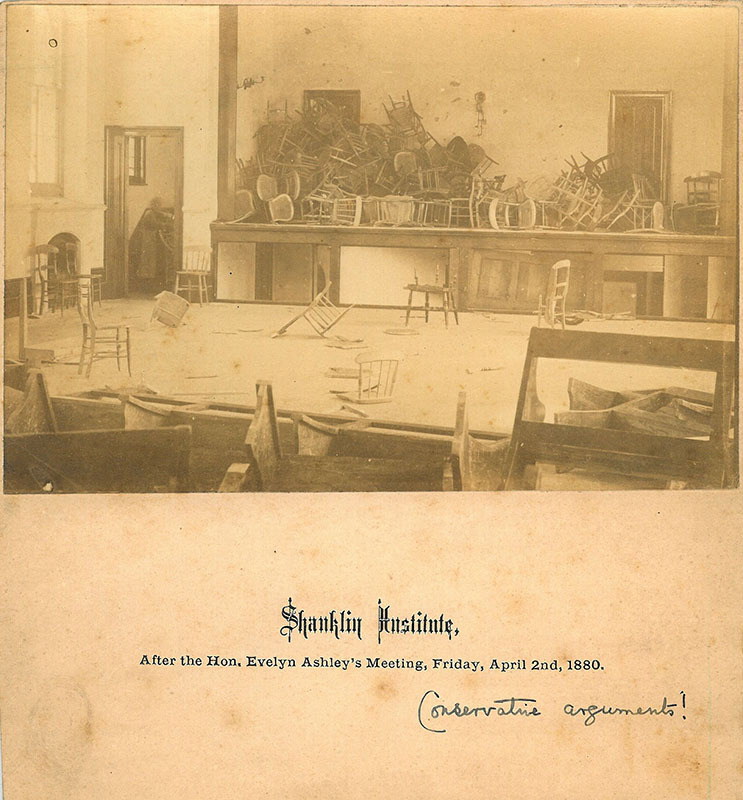 Within the vast array of material in the Broadlands Archives are sections of papers that tell specific stories: such as the correspondence relating to endeavours to secure a seat for Henry Temple, third Viscount Palmerston, in the House of Commons in 1805-7, or the photographs documenting the violent aftermath of an election address by Evelyn Ashley in Shanklin Institute in 1880. 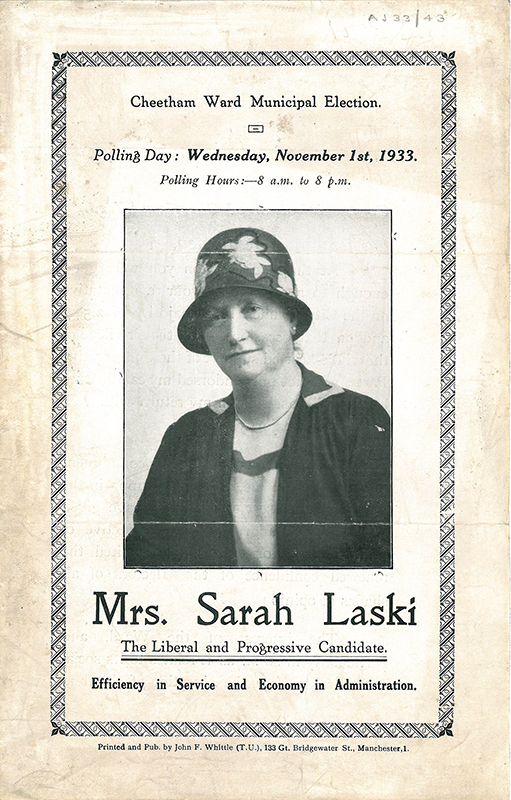 Amongst the Anglo-Jewish Archives are papers of a number of individuals who were involved in politics on a local, national and European level, this ranges from the leaflets produced by Sarah Laski during her election campaigns as a local councillor in Cheetham from the 1920s, to those of Fred Tuckman who was both a councillor for Camden in London and a MEP for Leicester. As you cast your vote in the General Election, you can be reasonably sure that your decision will remain private and certain that it will not become a matter of public record, open to the scrutiny of all. 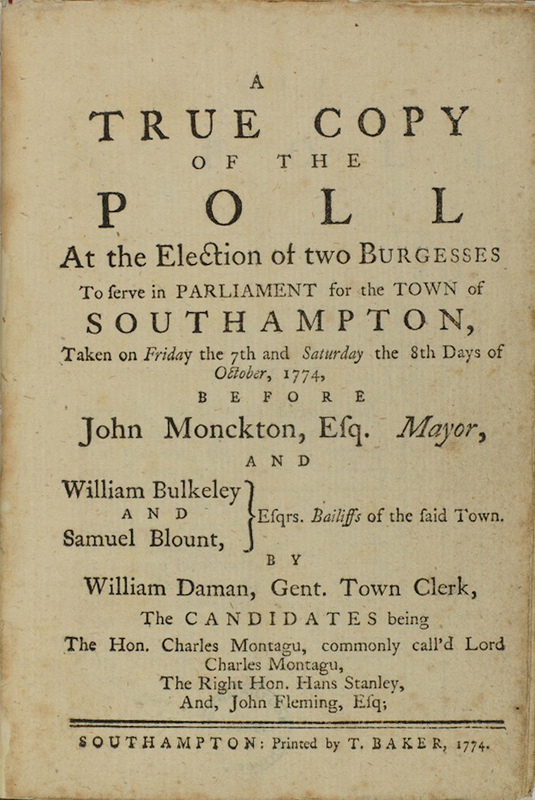 But the set of Southampton poll books in the Cope Collection shows that in earlier parliamentary elections this was not always the case. From 1696 until the Ballot Act of 1872 there was a legal requirement that returning officers should be able to provide a copy of the poll if requested, the aim being to prevent electoral fraud. 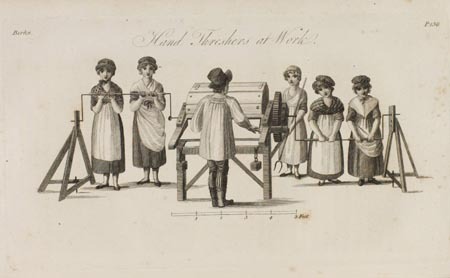 As printing became more widely established in the provinces, it became customary for poll books to be published by local printers and booksellers, rival businesses sometimes publishing their own copies of the same poll. 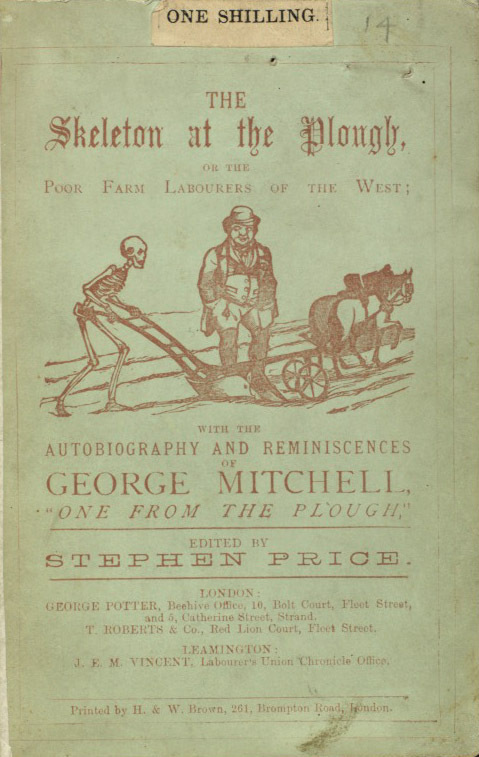 For Southampton, there are nineteen locally printed poll books running from 1774, shortly after the first printer appeared in the town, to 1865. They record the names of the voters and identify the candidates for whom they voted. In many cases addresses and occupations are also included, information which is of value to researchers today, despite the limited nature of the franchise. 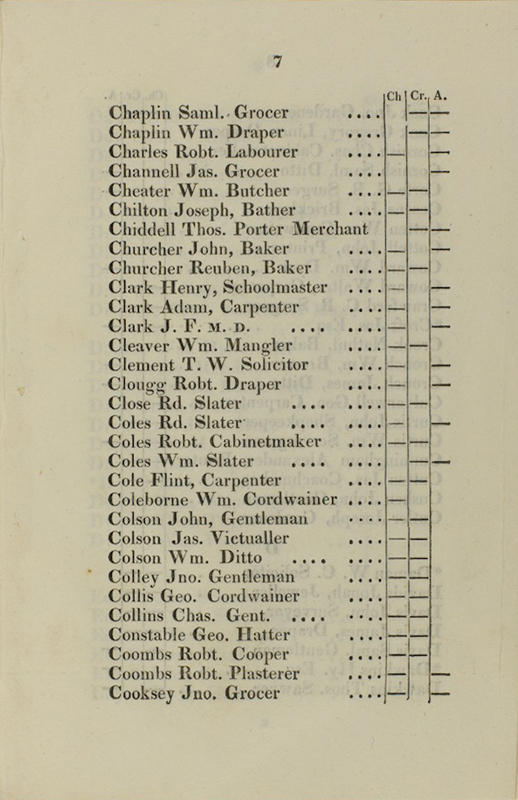 The books vary in arrangement, some listing the voters in the order in which they voted – the poll usually being held over several days, and others by alphabetical order or with the names grouped by candidate. The 1818 poll book records the votes cast for William Chamberlayne of Weston Grove, Lord Ashtown, of Chessel House and Sir William Champion de Crespigny of Anspach House at the end of a particularly divisive campaign which had seen the swearing in of 100 special constables in order to keep the peace. Most of the abuse had been directed towards Lord Ashtown, an Irish peer, who failed in his attempt to secure one of the two seats on offer for the town. 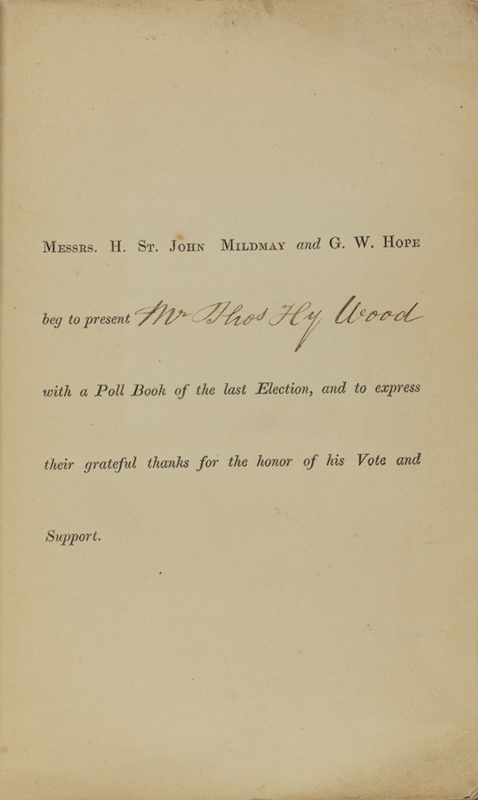 The presentation copy of the poll book of 1842 shows the newly elected M.P.s, Humphrey St. John Mildmay and George William Hope, rewarding Thomas Wood, one of their voters, with a printed copy of the poll. That Southampton’s voters were often more lavishly rewarded is suggested by the fact that this vote was held only because the poll in the previous year’s general election had been declared void, the two successful candidates having been found guilty of bribery. The Battle of Tolentino, fought on 2 and 3 May 1815, was the decisive battle of the Neapolitan War. However, the Austrian corps under Bianchi and Neipperg became separated on either side of the Apennine Mountains. In an attempt to take advantage of the situation, Murat planned to use the main part of his force to defeat Bianchi at the town of Tolentino, while dispatching a smaller force to delay Neipperg. Unfortunately for Murat, Bianchi successfully routed the Neapolitan garrison at Tolentino on 29 April. Establishing a defensive position in the town, Bianchi aimed to delay Murat for as long as possible. With time running out, Murat was finally forced to march on Tolentino on 2 May. The first day of the battle ended favourably for the Neapolitans. As fighting recommenced on 3 May they pressed forward. Anticipating a cavalry counterattack, Murat ordered two of his infantry divisions to advance in squares. However, no cavalry emerged and his troops were instead devastated by heavy musket fire. The situation was made worse when Murat was informed that Neipperg’s corps, having defeated the Neapolitan force sent to delay it, was now on the approach. On receiving further information that a Sicilian army had landed in the south of Italy, Murat sounded the retreat. “I have a most formidable account of the French cavalry. They have now 16,000 grosse cavalerie, of which 6000 are cuirassiers. They are getting horses to mount 42,000 cavalry, heavy and light. However, Napoleon, enraged by Murat’s premature actions and defeat, refused to receive him, and his offer to command the French cavalry was rejected. Not only did Murat’s actions and defeat at Tolentino mean that Austrian troops were now available for operations against France, it also meant that Napoleon would be robbed of his best cavalry commander at the battle of Waterloo.